The advent of the Nintendo DS into the handheld arena back in 2004 ushered in a fresh experience for many gamers, made possible by the system's many new features and abilities. This brand of entertainment was often referred to as "Touch! Generations" by Nintendo, and ran throughout the Nintendo DS and Wii era until its retirement in 2011. Touch! Generations is perhaps most remembered for its introduction of the "Brain Teaser" puzzle genre into the mainstream video game market. 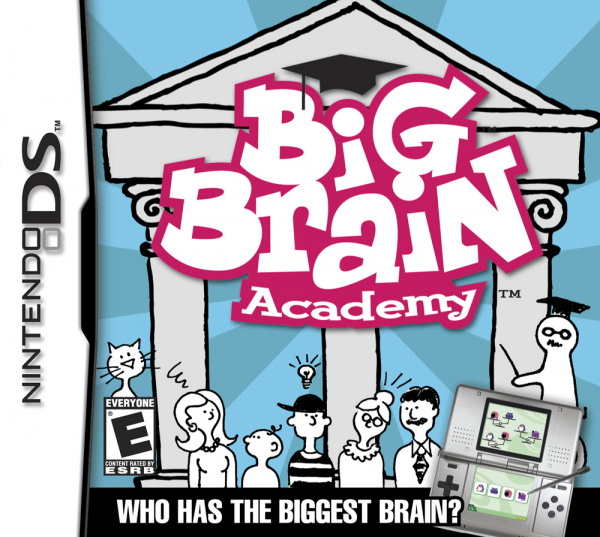 An odd mix of neuroscience meets video games - making impressive claims such as the ability to "Train your Brain", these Brain Training games took the Nintendo DS market by storm, with Big Brain Academy selling over 5 million units alone. Now, thanks to the addition of DS titles to the Wii U Virtual Console, gamers are able to experience these titles all over again. Unlike Dr. Kawashima's Brain Training: How Old is Your Brain? (AKA: Brain Age: Train Your Brain in Minutes a Day!) , that came before it, Big Brain Academy measures your intellect not by how "old" your brain is, but instead by how "heavy" it is. Of course, this measurement of mental dexterity is absolutely nonsensical, and was likely implemented in order to avoid the controversy Brain Training faced upon its release over its questionable scientific accuracy. Big Brain Academy makes no attempts to disguise the fact that it is a game first and foremost - from its colourful visuals to its crudely doodled mentor, Dr. Lobe (who just about manages to resemble a professor). While its presentation and method of determining your intellect set it out from the pack, Big Brain Academy also admirably quashes the rather ridiculous notion that intelligence and sharp wits are confined by age. 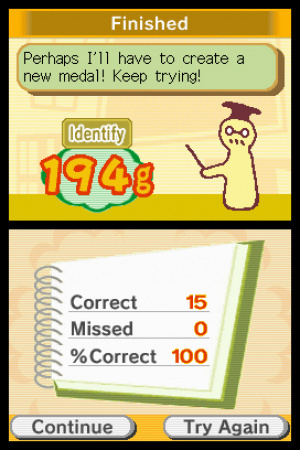 Contrary to many of the other brain-training games of the time, the mini-games found within Big Brain Academy won't have you scrawling barely legible numbers, sketching bizarre mangled animals onto the touchpad, or uttering sweet nothings into the microphone - as all the mini-games require simple actions (tapping on pairs or inputting numbers into a keypad), making Big Brain Academy feel a lot more like a series of interactive newspaper puzzles as opposed to a technical demonstration of what the DS could do, something many of the other titles were guilty of at the time. 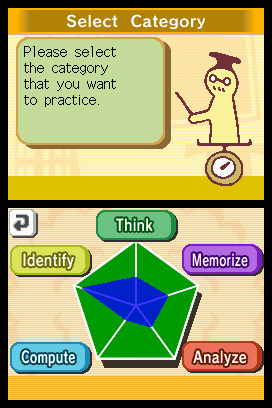 Big Brain Academy's challenges are split into five different mental classes: Think - logic centred questions, Compute - more mathematical based teasers, Memorise - a series of retention based puzzles requiring keen observation, Analyse - puzzles requiring an extra attentive set of eyes, and Identify - conundrums entirely based around visuals. Each of these groups houses three varying puzzles, a total of fifteen challenges to test your wits against. Fifteen puzzles may seem miserly, and surely seemed even more costly back during the title's initial release on the DS. However, each of these mini-games provides enough variety to stand out from the rest while avoiding the risk of becoming stale. In that sense, Big Brain Academy is much like a bijou box of chocolates - full of small, bite-size delectables of many varieties - only for your mind. Brain chocolates, if you will. In order to have your cerebrum graded, and your mind muscle's "weight" determined, one must undertake a "test". Within these, you will receive five miniature exams, each providing you a minute to show your ability at one of the puzzles randomly selected from each of the five classes. Once all five exams have been completed, Dr. Lobe will assess your performance and "weigh" your brain, giving you the good (or downright embarrassing) news, coupled with a description of your brain type (with the rather odd "Fashion Stylist" just one example). Upon receiving your results, Dr. Lobe will also construct a useful little radar chart, pointing out which of the classes you excel in, and which ones require more work. This allows you to go back into the practice mode and focus your attention, refining the areas which most require action. Whether you find a particular challenge amusing or bemusing, you'll always find a reason to keep replaying, as the more agreeable mini-games provide a wealth of fun, whereas the more arduous ones will keep you coming back in order to better your score and ultimately your brain. The brain weighing system does serve as an interesting and unusual way of demonstrating your brain's progress, but also acts as one of Big Brain Academy's flaws. By randomly selecting the mini-games that are chosen from each of the five categories, there is a chance you could be given five of your strongest or five of your weakest challenges, ultimately providing you with an one-sided assessment of your abilities. Of course, the solution to this would be to practice each and every one of the fifteen mini-games - mastering each and every one and becoming some sort of Big Brain Academy demigod. So, there's no need to fret. Big Brain Academy's presentation is pleasant enough, even if the rather abstract Dr. Lobe pales in comparison to the far more entertaining and expressive Dr. Kawashima. 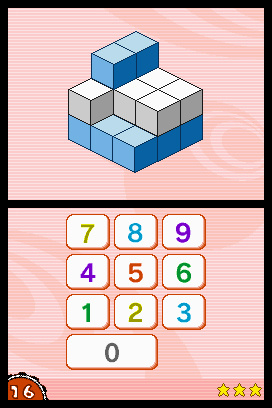 The puzzles are presented in a bright, colourful and occasionally bizarre fashion. Despite what appears to be rather static art assets used within the many challenges, such as odd caricatures of children, animals and vehicles; upon closer inspection each of these have their own unique animations - winking, smiling and making a wide array of peculiar noises. These little animations not only make the challenges all the more tricky - throwing off your concentration by acting as a mental hurdle to block out, they also give Big Brain Academy a touch of personality and charm usually missing in the genre. 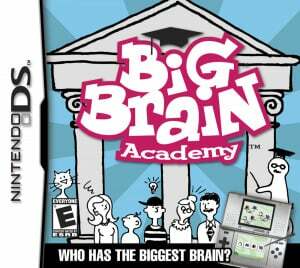 While Big Brain Academy isn't the DS title we were clamouring for as part of the DS Virtual Console library, it certainly isn't a disappointing one. The incompatibility of the built-in multiplayer mode is a little regrettable (though understandable), and makes the overall package feel somewhat incomplete. Nevertheless, Big Brain Academy provides both amusement and practicality, serving as a great brain-teasing title, great to not only to pass the time, but to keep your brain sharp. Oh, and "heavy". I did like this more than Brain Age. I found this more fun than the Brain Age series. I even enjoyed the Wii game... it was a lot of fun with friends. @ekreig Yeah. It's crazy to think that the DS came out a full 3 years before the first iPhone even existed. I liked Brain Age better, but this was still fun to play. @ekreig That's indeed true. Back then I would be interested in a such game. Now: I've seen this multiple times on mobiles. Again, why the DS version and not the Wii version? @ueI Me too, it feels more like a game than Brain Age does. The challenges are all great.